In previous versions, an iOS device was registered to a specific pilot account. It worked well for most users, but was an inconvenience for pilots who wanted to share a device, e.g., for flight schools. In the CloudAhoy 3.0 app you can tap Logout on a given iOS device, and let another pilot login to his or her account. BTW, with 3.0 you can be simultaneously logged-in to any number of iOS devices. Your name is always entered as either the pilot or the co-pilot/CFI. 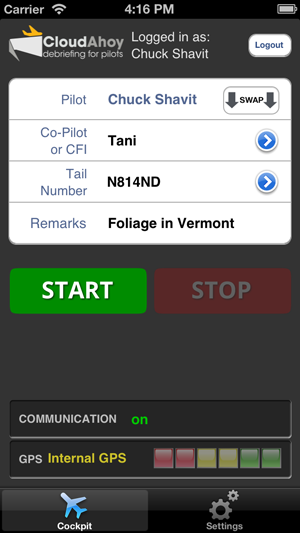 Tap “Swap” to flip between the names in the pilot and co-pilot fields. To enter a name of CloudAhoy buddy into the pilot or co-pilot field, tap the blue arrow and select the buddy. The flight will appear in both your flight lists. If the other pilot is not a CloudAhoy buddy of yours, you can enter his or her email, and the flight will appear also in his or her CloudAhoy flight list. CloudAhoy users have asked us to improve the new account sign-up procedure. In 3.0 we redesigned the sign-up, and we hope that it is much easier than before.